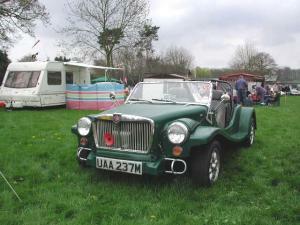 The Magenta sprang to the kit car scene in 1972 and was hailed by the company as a sports tourer. A bit optimistic and many settled for buggy. It proved popular though no doubt due to it's GBP250 price tag and expected GBP350 build cost. It was based on the MG 1100 (BMC 1100) which donated it's subframes, engine and gearbox and other assorted items including the MG 110 grille which gave it that unique look. The Magenta sold in the hundreds so there are still plenty to be spotted at kit car shows. Further modifications came in the guise of the Roadster and Sprint which had modified front ends and donor changes which included Ford and Mini components.